CFA or MBA: Could Certification Replace Degree in Finance? » CFA or MBA: Could Certification Replace Degree in Finance? A typical MBA program includes not only financial and investment analysis, but also accounting, marketing and general business. More importantly, it is a great place to interact with other students and a valuable networking opportunity. There are firms that specifically look for professionals with degree beyond undergraduate level. Also, for professional designation that requires advanced education (e.g CPA), the MBA degree can get your qualified. Although you can theoretically complete the CFA program within 18 months, most candidates needs 4 years to get it done. A typical MBA program is 2 years and is therefore faster to complete. Once you get your MBA, the knowledge and title is yours for the rest of the career. For CFA, you will have to pay the annual fee and fulfill the necessary CPE requirements. The amount isn’t much but it can be a hassle. The CFA designation is granted by one single entity and all CFA charterholders go through the same series of exam to earn this title. 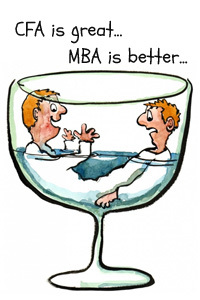 For MBA, it is more complicated since the quality of the issuing school can be vastly different. Getting a MBA from an unknown school adds little value when it comes to recruiting and career advancement. Put it in another say, for those who cannot get into the top MBA program, the CFA Charter can be a great equalizer that put you at the same level playing field. If you are looking for investment related jobs, people do seem to appreciate the CFA qualification. The total cost could be as low as $3,000, which is more affordable than a typical MBA program. Most people also work full-time and earn a living while studying for the CFA exam. Another important reason is that the CFA program is based on self-study and can be done without leaving your current job. If It’s Hard to Choose between CFA or MBA, Can We do Both? I see the MBA and CFA quite differently: MBA is an academic degree while CFA is a professional designation. For MBA, the critical point is where you are getting the MBA from. An MBA from Harvard is quite likely better than a CFA qualification alone; but an MBA from an unknown school or “diploma mill” will be of little use. In terms of the practical question of which designation will help find a job, it is complicated because a CFA or MBA alone should not be the deciding factor. The educational and more importantly working experience count a lot too, so do the performance during the interviews. Having both is certainly a “win-win” strategy that works for many people, but then, either CFA or MBA require significant commitment for one to pursue. At the end of the day, the school or the designation is not what gets you the job – you are! Financial Times: Will CFA become the new MBA? How Many CFA Charterholders are there in the World? I’m CMA holder and I want to go on my career path but I’m ask the same question.. which is better for me .. CFA or MBA? Hi Sayed, if it is a low-ranked MBA versus CFA, I would definitely choose CFA. It is harder to take this exam at 35, but definitely not impossible. Best of luck in whichever way you choose!